Sidra Khan’s hat trick was the highlight as Gloucestershire Women secured the Division 4 championship and promotion back to Division 3 with a comprehensive win against Dorset at Dean Park in Bournemouth. Khan’s hat trick came in fantastic figures of 5.4 – 3 – 3 – 5 with all three batters being bowled. With most of the team departing from Gloucestershire well before 7am in the morning, it was a slightly weary group that arrived in Bournemouth at 9.15am to be greeted with a very wet square and the prospect of a delayed start. Thankfully the ground staff worked superbly to get things ready and play started 75 mins late at 12.15pm after Dorset had won the toss and decided to field. Conditions were not going to be easy with a slow wicket, very slow outfield and 90m boundaries! Alice Hill and Charlie Walker opened the batting and continued their successful partnership with both batting intelligently and with a good understanding. With boundaries in short supply they ran plenty of singles, twos and threes as they put on 61 in 13.3 overs before Alice got a leading edge and was caught at short mid wicket for 32 from 44 balls. Bethan Moorcraft fell in exactly the same way for 6 and was then followed by Walker who again was defeated by the slow wicket, caught at short extra for 32 from 53 balls. Naomi Forecast and Danielle Gibson then entertained the watching support with an exciting partnership. 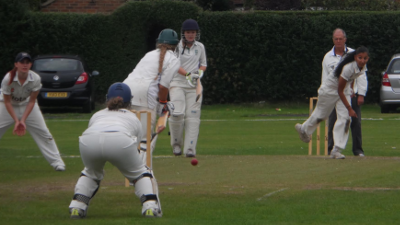 Naomi picked the gaps skilfully and Danielle attacked the bowling positively as the pair put on 65 in 10.3 overs. Gibson was then caught at short extra cover for 27 from 28 balls with 2 boundaries. Forecast, who has been in prolific form for the U17’s this season, continued in a partnership with Eve Alder and after despatching a full toss to the mid wicket boundary, reached her first senior half century from 55 balls. She was then caught shortly after for an excellent 51. Alder and April Wells continued to push up the total as they put on 44 before Wells was bowled for 15. Eve’s intelligent knock kept pushing the score towards the 250 mark and she and Hannah Thompson continued to hit the gaps as they put on 27 in only 3 overs without a boundary! Eve was run out from the penultimate ball of the innings for 36, with Hannah finishing on 14 not out as Gloucestershire posted 249 – 8 from their 50 overs. After a reduced break, Gloucestershire set out to defend 249 and got off to a great start with 2 wickets in the first 5 overs for Charlie Walker as she trapped Lowman lbw for 1 and bowled Oliver without scoring to reduce Dorset to 9 – 2. Pearce and Pack then frustrated the bowlers as they put on 25 in 10 overs before Chloe Davis got an lbw decision to dismiss Pack for 11. The introduction of Sidra Khan saw a remarkable collapse as Dorset slipped from 41 – 3 to 48 – 9 in only 3.2 overs. Khan’s hat trick came in the 21st over as she clean bowled Callaghan, Brown and Rickman to wild celebrations from everyone of her team mates – a fantastic achievement from a very popular member of the team. Chloe Davis then chipped in with 2 further wickets, one lbw and the other a catch off her own bowling, before Charlie Walker took a smart flat catch at cover to give Khan her 4th wicket. It was Sidra who finished the match with her 5th wicket having Thomas caught behind by Laura Marshall as Dorset were bowled out for 62 in 28.4 overs. Davis finished with a fine 3 – 26 from 10 overs of leg spin, Walker 2 – 7 from 4 overs and there were tight spells without luck from Eve Alder 0 – 7 from 4 and Alice Hill 0 – 9 from 5 overs. The star of the bowling show however was Sidra Khan with 5 – 3 from 5.4 overs. The final wicket was met by delighted celebrations from the whole team as the win secured promotion back to Division 3. The team only dropped 1 point in their 4 games and finished with a game average of 17.75.